As a mom, I spend more time and care over the appearance of my child with Down syndrome than I did with my typical son. First impressions count. That’s a fact. I hate vocalizing that. It makes me feel shallow and discriminatory. But a discussion with other moms of kids with DS proved that I was not alone. We take more care and spend more money choosing clothes, we wipe little noses more often so that they’re free from boogers, we battle fidget monsters to make sure hair is done, teeth are brushed and faces are washed. We feel that we are fighting against the stereotype of a disability that is written all over their little faces. One that only a generation ago would’ve landed them in an institution where they were often neglected, uncared for and unloved. Making sure they look well cared for feels like a statement of their worth. It says “Look at me. I am important. I am a person. I am loved. 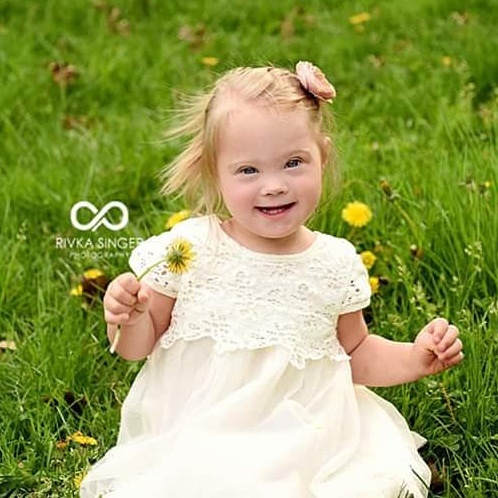 Maybe you can love me, too.” Most of us are ashamed we feel this way, but, on the other hand, we’re super proud of all of these little babies with DS looking adorable and challenging perceptions. It’s complicated. At any rate, mom guilt aside, I hope that fostering good hygeine habits and a pride in her appearance will serve her well in the future. She’s already got a killer sense of style!